Why Is Spinner Luggage So Popular? 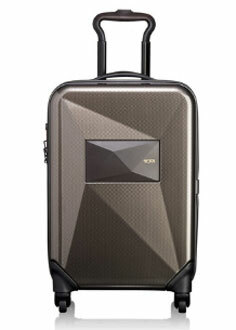 Spinner luggage is becoming increasingly popular, as you will see in any airport around the world. There are good reasons for this popularity. Spinners are so easy to maneuver but require only minimum effort. Spinner is an upright bag with special spinner wheels for easy movement in any direction, i.e. the wheels can rotate in 360-degrees. The wheels are what make the luggage a spinner instead of traditional wheeled bag. The spinner wheels allow you to move the spinner easily in any direction with little resistance. Most spinners have four spinner wheels located on each of the four corners of the luggage. You can also get spinner with eight wheels or four double wheels. Spinners are very popular as Carry-On bags but you can also get Check-In Spinner Suitcases. 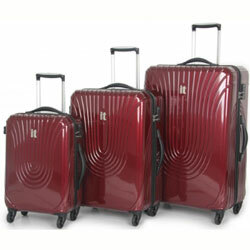 Spinner luggage set usually include both carry-on and check-in bags. What Are The Benefits Of Spinner Luggage? The biggest benefit of spinners is how easy and effortless it is to move them in any direction. The 360-degree rotation spinner wheels allow you to pull, push, and turn the bag in any direction with minimum effort. This makes it easy to maneuver spinners in tight and busy places, like airport and train stations are. This also reduces the strain on your arms and back, i.e. the spinner glides in any direction with minimum physical effort on your part. This makes spinners great choice for older people and people with limited mobility. Are The Any Downsides To Spinners? The benefits of spinner luggage easily outweigh any downsides for most travelers. There are though few things worth being aware off before buying your first spinner. Spinners usually weigh a little bit more because of the sturdy spinner wheeling system. The spinner wheels are also quite exposed (unprotected), which makes them more vulnerable for damage / falling off. This means good quality luggage wheels are important spinner feature, adding to the price of spinners. This is why spinners tend to be somewhat more expensive than similar wheeled versions. You can though find good spinner bags in all price ranges. Finally, be careful when going down slopes and never let go off your spinner bag on sloping surfaces. The spinner wheels are what allow you to maneuver the bag easily in all directions and make the luggage a spinner and not a traditional wheeled luggage. The wheels can be the weakest part of the spinner as quite unprotected, making them vulnerable for accidental damage or from falling off. This is why you want your spinner to have good quality luggage wheels. You also want your spinner to have good luggage handle system, ideally telescoping ergonomic handle system. The telescoping handle system should be easy to extend (ideally with one hand) and lock firmly in place. While ergonomic handles allow you to rotate the luggage 360 degrees with minimum effort, reducing shoulder, elbow and wrist strain. Spinners come in all the popular luggage materials, i.e. polyester, ballistic nylon, leather, polycarbonate, polypropylene, aluminum, etc. Each material has its own characteristics, i.e. some are more durable than others are, some are easier to maintain and some are more lightweight. If you prefer soft luggage material then ballistic nylon is good choice as very durable and easy to clean. While polyester is popular choice for smaller and less expensive bags. Soft-sided spinners offer you more flexibility but hard-sided spinners offer better protection. Hard-sided spinners are usually made from polycarbonate, ABS, polypropylene or aluminum. You can get similarly durable, lightweight, and priced, soft and hard-sided luggage now a day. It is mainly matter of preference which luggage material to choose for your new spinner.